Analysis: Vollert went undrafted out of Weber State last April and spent time on the Cardinals' and Bengals' practice squads in 2018. Despite ending up with four tight ends on injured reserve, the 23-year-old was never signed to Cincinnati's 53-man roster. Analysis: Vollert, an undrafted rookie out of Weber State, was previously released from Arizona's practice squad on October 31. 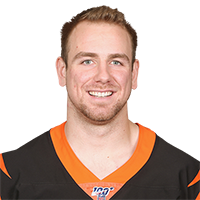 He'll attempt to show well on the Bengals' practice squad, and he could conceivably earn a depth role in Cincinnati's injury-riddled tight end room. There are no videos available for Andrew Vollert. Click here to view all videos.